Okay, so I’m sure you’ve heard of NaNoWriMo, National Novel Writing Month, which takes place every November, where the goal is to write a 50,000 word novel in the thirty days of November. Well, I have not participated in the November NaNoWriMo yet. Seems too stressful to me in a month with a major holiday, right before a month with an even bigger major holiday, two of the three holidays that are most important to our family. 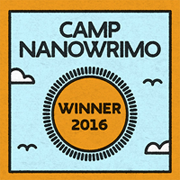 But, now there’s Camp NaNoWriMo in the month of July! This one lets you set your own goal for the month of July. You also get to be part of a group who share a “cabin” (this is all online), where you can encourage each other throughout the month through messages you post in your cabin. You write in whatever program you normally write on your computer and simply update your word count every time you write and add words to your novel or whatever project you are working on. I chose to do this because a couple of friends were doing it and encouraged me, plus I needed some motivation, but not too much stress. So, I had about 14,000 words written in my novel in progress, so I set my goal for 30,000 words. I figured that was more than half of what I’d already written, but still a challenge for me. Here we are on the 10th of the month and I have not written every day, but I am still on track to meet my goal according to the stats the Camp NaNoWriMo website keeps for me. Seeing that helps my motivation too. How about you? Have you ever participated in NaNoWriMo or Camp NaNoWriMo? What was your experience?